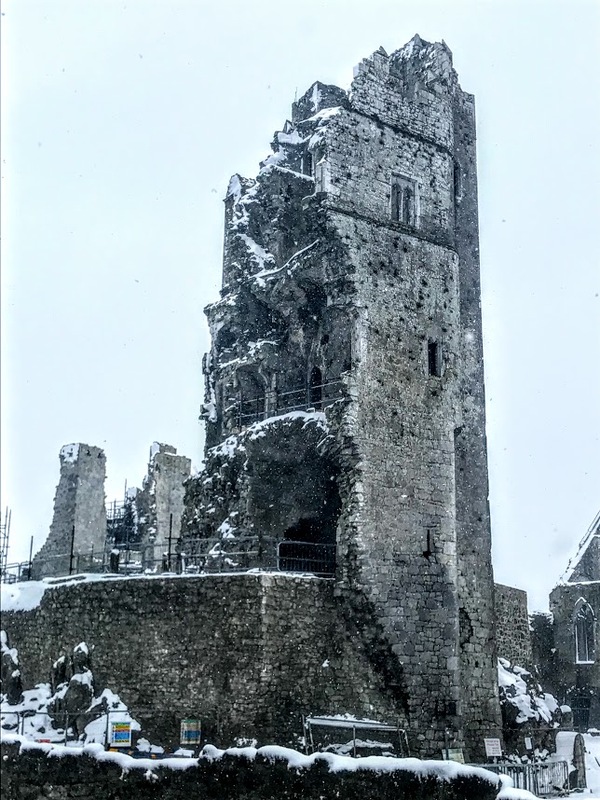 It’s like a winter wonderland in Askeaton today. I was supposed to be in Dublin today, co-chairing an interfaith seminar in the Church of Ireland Theological Institute and present as a representative of the Diocese of Limerick and Killaloe. But that was cancelled on Wednesday morning, due to the ‘red alert’ warnings that predicted a nation-wide shut-down by today. I might never have got there, anyway, as most public transport has been cancelled since mid-day yesterday. 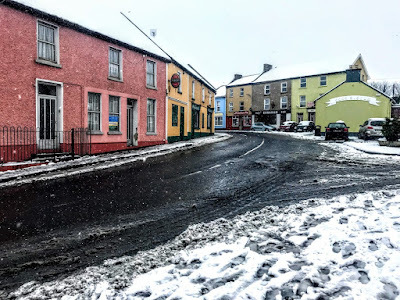 Even still, I thought the worst of the ‘Beast from the East’ and ‘Storm Emma’ had by-passed this part of West Limerick. But panic set into this area by Thursday morning, and people were buying in bulk before the shops closed in the early afternoon. Nobody expects the ‘bleak mid-winter’ after the daffodils have begun to bloom. The alerts were for other parts of Ireland, especially Leinster and south Munster. The snow was falling heavily as darkness began to close in last night. 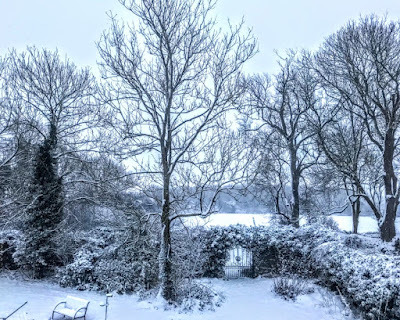 I awoke to see the rectory grounds covered in blanket-upon-blanket of snow this morning. The birds are hopping around all day, as it continues to snow, searching for any morsels of food in the snow. I worked in the house all morning, preparing work for the week after next, and looking after a few administrative tasks. But by this afternoon I needed to get out, even if only for a few logs for the fire later this evening. Once out, I had to go for a walk. 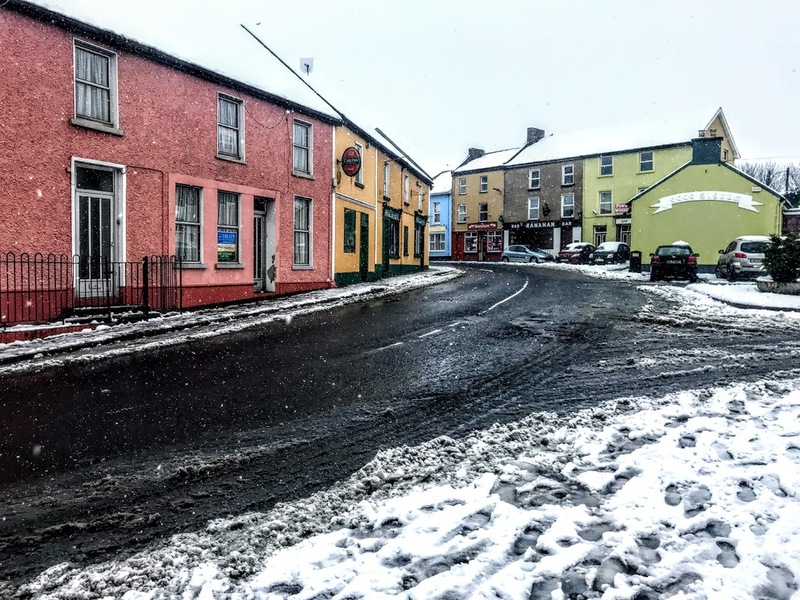 Almost every shop in Askeaton is closed, including the SuperValu supermarket, the hardware shop, the pharmacists, the coffee shop and the swimming pool and leisure centre. Even shops that had posted notices in their windows saying they would open by noon today were still closed at 3 p.m.
Only one or two pubs were open. But it’s Lent, and it was too early in the day to call in to see how many people had decided to go out this afternoon. 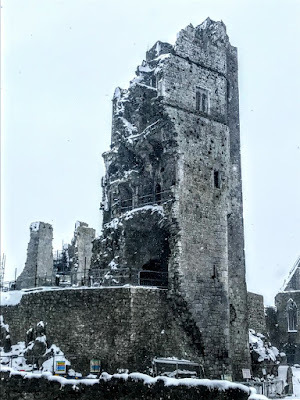 The only real life on the streets was a few children playing snowballs, and another man enjoying taking photographs from the bridge of the castle covered in snow. I called on a parishioner, checked on the church and the churchyard, and walked as on across the bridge and along the banks of the River Deel far as the Leisure Centre on the bank opposite the ruins of the Franciscan Friary. Back in the Rectory, it seemed wise to consult parishioners in Tarbert about the wisdom of continuing with or cancelling Morning Prayer next Sunday in Saint Brendan’s Church, Kilnaughtin. 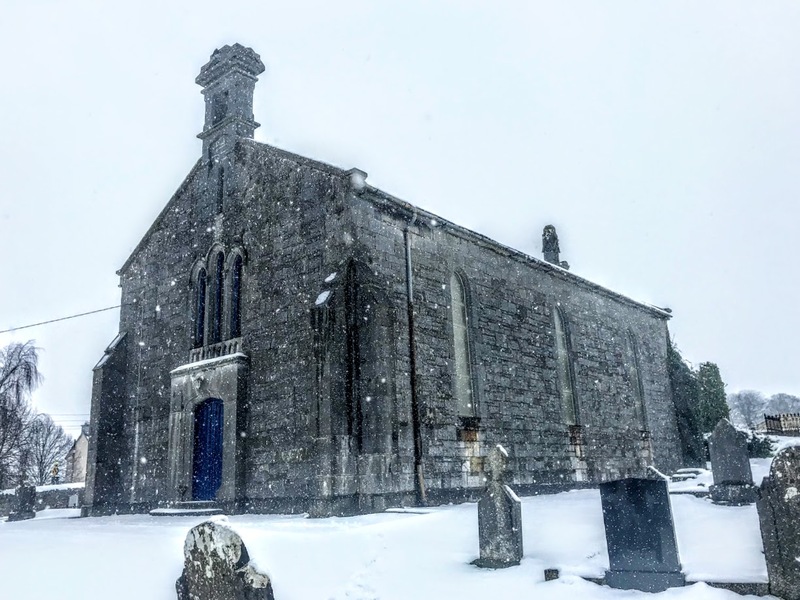 It is on a steep hill outside the town, looking down on the Shannon Estuary, and parishioners who live further away are unlikely to brave the snow piles and icy roads on Sunday morning. After a few phone calls it seemed best to call off this one service, but to continue with plans for the Parish Eucharist at 930 on Sunday morning in Saint Mary’s Church, Askeaton. I have plans to fly out from Shannon Airport on Sunday afternoon for a short city break in Warsaw. I was hoping to see the site of the Warsaw Ghetto and other sites in the Polish capital, and Shannon Airport is due to open for flights again tomorrow. The poet Michael Harding had an epic return journey to Leitrim from Warsaw this week that brought him through Liverpool and Shannon with Ryanair. But getting from Shannon to Warsaw is becoming increasingly unlikely as we move into the weekend, and there is a growing possibility that those plans are going to be cancelled too. Because of the continuing weather alerts, there will be only one service in the Rathkeale and Kilnaughtin Group of Parishes on Sunday morning, 4 March 2018 (the Third Sunday in Lent). 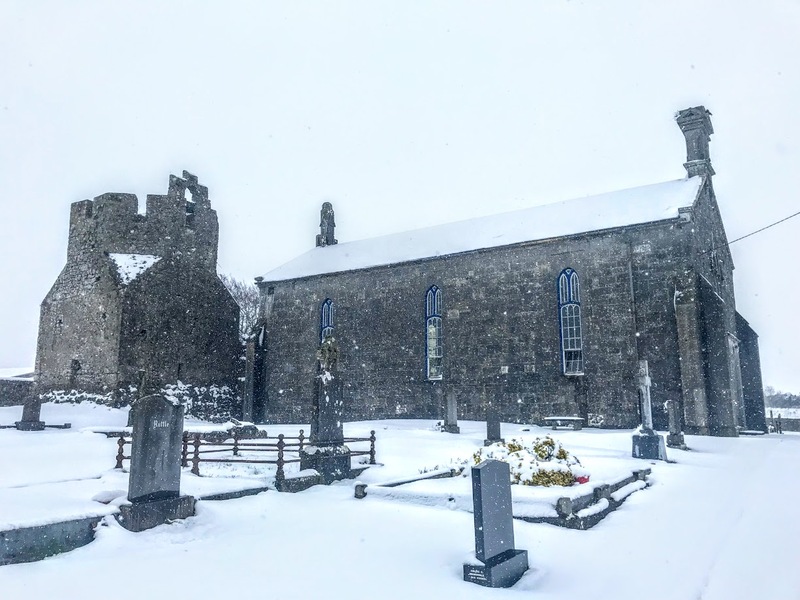 There will be a celebration of Holy Communion in Saint Mary’s Church, Askeaton, at 9.30 a.m. However, parishioners are asked to heed weather warnings and not to take risks on Sunday morning. 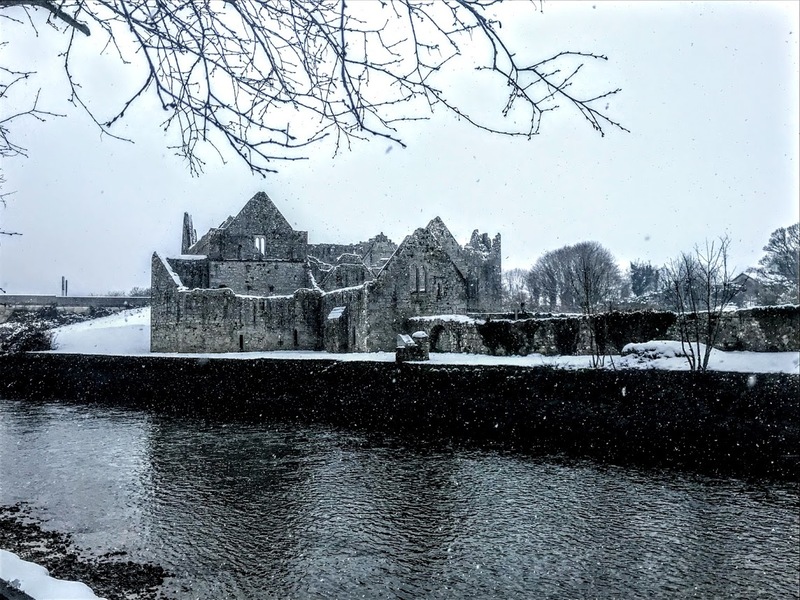 ‘As the forecast for the weekend is not good, I make the following suggestions for Sunday March 4th in order to enable you to worship at home and to feel part of the family of the Church of Ireland. The meteorological situation may change in the meantime but we have no assurance that this will be the case as things stand and currently we are all encouraged to stay indoors for the foreseeable future. ‘As well as services being broadcast on RTE television and RTE radio, Christ Church Cathedral and Saint Patrick’s Cathedral live stream their Sunday morning services. If you find that you cannot safely make it to your parish church this coming Sunday, you might like to follow one of these options. The Passover of the Jews was near, and Jesus went up to Jerusalem. In the temple he found people selling cattle, sheep, and doves, and the money-changers seated at their tables. Making a whip of cords, he drove all of them out of the temple, both the sheep and the cattle. 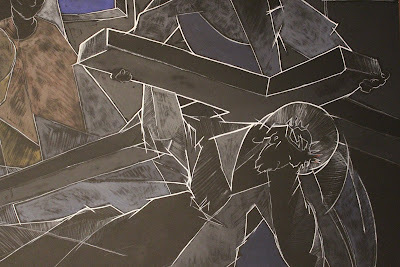 He also poured out the coins of the money–changers and overturned their tables. He told those who were selling the doves, ‘Take these things out of here! Stop making my Father’s house a market-place!’ His disciples remembered that it was written, ‘Zeal for your house will consume me.’ The Jews then said to him, ‘What sign can you show us for doing this?’ Jesus answered them, ‘Destroy this temple, and in three days I will raise it up.’ The Jews then said, ‘This temple has been under construction for forty-six years, and will you raise it up in three days?’ But he was speaking of the temple of his body. After he was raised from the dead, his disciples remembered that he had said this; and they believed the scripture and the word that Jesus had spoken. The idea for this series of morning Lenten meditations came from reading about Peter Walker’s new exhibition, ‘Imagining the Crucifixion,’ inspired by the Stations of the Cross, which opened in Lichfield Cathedral last week and continues throughout Lent. For the next two weeks, I am looking at the 14 Stations of the Cross at Saint John’s Well outside Millstreet in north Co Cork. Saint John’s Well is 8 or 9 km south-east of Millstreet, on the slopes of Mushera, on the Aubane side of the mountain, opposite the entrance to Millstreet Country Park and a short distance from the Cork/Kerry border. My mother was born in Millstreet, and I visited these Stations for the first time last summer during a visit to Millstreet, when my cousin brought me to visit some old family houses and around the surrounding countryside on a Sunday afternoon. Until the 1940s, this well was the centre of a pattern on the Feast of the Birth of Saint John the Baptist, 24 June. But the days were marked by drinking and often ended in fighting and even with faction fights. In 1954, Michael Buckley of Aubane bought an image of Saint John the Evangelist (not Saint John the Baptist) and placed it in the grotto early on Saint John’s Day. Later that day, the late Sonny Buckley of Tullig, Millstreet, decided to erect a timber altar to protect the picture on the windswept site. A committee was formed in the Aubane to raise funds to build the centre grotto using voluntary labour. In 1958, a statue of Saint John was placed in the central grotto – once again this was a statue of Saint John the Evangelist, not Saint John the Baptist – and two side grottos were erected, one with the altar with the original picture and the other an altar with a statue of the Infant of Prague. The statue of Saint John was blessed 60 years ago in 1958 by Canon Michael Costello, Parish Priest of Millstreet. The first Mass at the grotto was celebrated on 24 June 1974 and Mass has been celebrated there every year since. When Sonny Buckley died in 1979, he left £500 in his will for the erection of Stations of the Cross at the well, with the approval of the Forestry Department. The Stations were designed by Liam Cosgrave and Sons, Sculptors, of Blackpool, Cork. First, 14 concrete slabs were made for the Stations. Then the ground was filled with limestone from Ballygiblin. Most of the building work was carried out by John and Brendan Kelleher. The Stations were blessed by Canon P Brown, Parish Priest of Millstreet, on the Feast of Saint John the Baptist, 24 June 1982. A Faith and Light group visited the place in 1985 and acted out the Passion and Death of Our Lord. In 2010, the Forestry Department felled many trees around the site, the area was landscaped by the Saint John’s Well Committee, waterfalls were constructed and footbridges were erected. Tomorrow: Millstreet 1: Jesus is condemned to death.